The ellagitannins are a group of phenolic compounds with biological activities. Ellagic acid is the product obtained from hydrolysis of ellagitannins. Information related to the biosynthesis of ellagitannins still been scarce and confused. The ellagitannins are obtained from plants and their purification process implies mainly the use of chromatographic techniques. The ellagitannin acyl hydrolase (EAH) also known as ellagitannase is an enzyme capable of hydrolyzing the ester bonds of ellagitannins and the consequent releasing of ellagic acid. Information about the EAH is not clear because the enzyme had showed different activities due to the low purity or complexity of substrates and there is no available information about the biochemical, physicochemical and molecular characteristics of EAH. 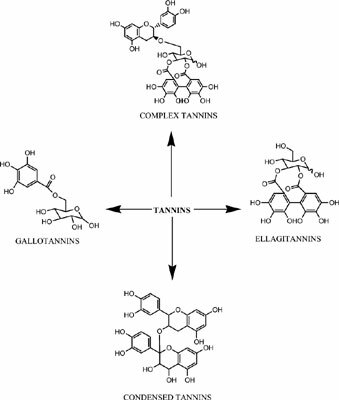 The present review describes information related to the sources, biosynthesis and the purification of ellagitannins and a current assessment on the production of ellagitannase. Biosynthesis, chromatography techniques, ellagic acid, ellagitanase, ellagitannins, purification.